Buried at Llanfabon Cemetery, Grave ref 39.7 to the left of the main pathway. 104, Bonvilston Road, Trallwn, Pontypridd. Thomas at this time was in employment as a road worker. He carried out the general labouring involved in the making of roads, but was also trained as a paving cutter. Gunner Tom Exon, Royal Garrison Artillery, 16, Thomas Street, Nelson passed away on Tuesday 7th May 1918 at Freshwater Military Hospital, Isle of Wight. Gunner Exon, 40 years old, who enlisted about 12 months ago and has been in poor health ever since, was only taken to the hospital on Tuesday last. The nature of his illness is still not known. 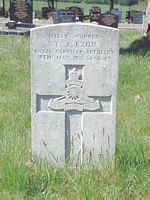 This is the 3rd Nelson soldier to die whilst in training. On Saturday evening the remains of Gunner Tom Exon, Royal Garrison Artillery, of 10 Thomas Street, were brought home to Nelson from Freshwater, Isle of Wight where he had died in hospital the previous Tuesday. There was a large and sympathetic crowd awaiting the arrival at the T.V.R. station, and the coffin was borne reverently on the shoulders of friends to the deceased’s home only a short distance away. Gunner Exon was well known locally and prior to being called to the colours worked as a repairer at Penallta Colliery. He was 40 years of age and it is said he was not at all physically fit for army life, being subject to rheumatism. The funeral took place on Tuesday at Llanfabon Churchyard with full military honours. The coffin was draped with the Union Jack and was escorted by the Treharris detachment of the discharged sailors and soldiers (under ex Serjt M Andrews).